Probably no team wanted to win the Champions League more than Trinidad & Tobago. It was the last time the players from the twin-island republic would get the opportunity to play as a national team in this competition, so they will have wanted to sign off winning the title. So a campaign that ended in a semi-final defeat would have been a disappointment. But it ought not to be a huge one. Since their initial venture to India in 2009, T&T's brand of T20 cricket has been a big seller. That first adventure, which saw Daren Ganga's team reach the final, brought Kieron Pollard into world focus and to the attention of Mumbai Indians. In 2011, T&T's failure to get out of the group stage did not prevent Sunil Narine's talents from being recognised by Kolkata Knight Riders. So it must have been with a certain sense of expectation that IPL owners and their men of business watched the Red Force's games this year. And they have another name to consider now: Evin Lewis. Hidden from view through his mystifying non-selection in the Caribbean Premier League draft, the fearless young opener spoke up for himself with a team-leading 211 runs in five games at a healthy average of 42.20 and a strike rate that crossed 141. His left-handed play was forceful and confident, he let his inexperience at this level be no hindrance, and he consistently got the T&T innings flowing in the Powerplay overs. Here was another interesting product from the islands, another plank upon which the Tourism Development Company, with sports ambassador Brian Lara as its front man, could sell the T&T brand. The problem in this competition, however, was that there was not enough depth of quality batting to make Lewis' contribution the real bonus it could have been. The irony of Pollard being the man to stop the Lewis train in the semi-final will not have been lost on T&T coach David Williams. If IPL money were not such an influential thing, Lewis and Pollard would have been on the same side on Saturday night and maybe even playing in the final against Rajasthan Royals. But the holes Pollard and Chennai Super Kings' Dwayne Bravo have left in the T&T middle order have never been filled, not at Champions League level. And that lack of heavy artillery in this series was not compensated for by the top order. With just one half-century in the final group-match demolition of Super Kings, and having failed to score in three of his five innings, Lendl Simmons was well below par. His lack of runs added to the pressure on Darren Bravo (154 runs) to bat deep into the innings. It was a pity that Yannick Ottley did not get more than two games to show his all-round usefulness, especially with the bat; for in their two defeats in the series, it was those missing extra 15 runs or so that made the difference. The bowling was not to blame. T&T's varied attack is their strength. If Knight Riders had had better results in this year's IPL, Narine would not have been wearing the T&T red. But his presence in the side gave his captain, Denesh Ramdin, an ace he could play at any time. His mystery spinner allowed him to take calculated risks, allowing him to keep hope alive when it began to fail, like against Titans when Narine was bowled out with four overs still remaining in the innings, his two wickets in the 16th over turning the match in favour of the Caribbean side. Narine's 11 wickets in the series made him the tournament leader up to the semi-final stage. But new-ball bowler Ravi Rampaul and fellow seamer Rayad Emrit also had their moments. Emrit, who took some beatings, repaid his captain's faith with his three wickets against Super Kings that helped limit the match favourites to 118. Even Simmons chipped in with useful wickets at times. Indeed T&T were a team of varied talents banded together by a spirit built up over years of playing and growing up in the game together. Their expertise at T20 has continued to encourage more talent in that arena. In future, however, it will be up to the Trinidad-based CPL franchise, the Red Steel, to bring that talent through. Selectoral miscalculations left Lewis and Ottley on the sidelines in the CPL's inaugural season. That is unlikely to happen next year. 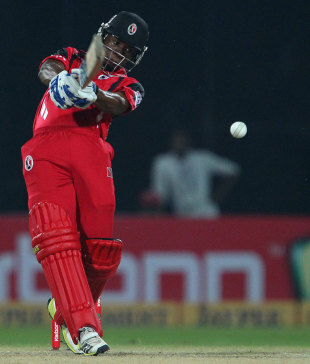 Nicholas Pooran did not do much in the Champions League, but seems to have the self-belief that will make failure temporary. Given time to develop without the burden of unreasonable expectations, he may yet become a star attraction in a T20 league near you. Yes, the Force has faded from the T20 scene, but the T&T flavour in the Champions League should remain strong for years to come.